Cosecha Restaurant (co-say-cha), is situated in rural Franschhoek on the Noble Hill Wine Estate. The magnificent Cosecha Restaurant offers fresh Latin cooking with breath-taking vineyard views as an added bonus. The name, Cosecha, is Spanish for “harvest” and it reflects the location of the restaurant next to the harvest area where the grapes are sorted and crushed for the delicious Noble Hill range of wines. Ingredients for Cosecha Restaurant are grown on the Noble Hill Wine Estate where possible and we maintain a thriving pepper and vegetable garden which you are free to explore during your visit to our lovely Franschhoek restaurant. As a visitor to Cosecha Restaurant you are also most welcome to book one of our famous Latin-inspired picnics. Upon your arrival you are welcome to choose a comfortable location on the lawn. Blankets are available upon request and drinks will be served by a member of our restaurant staff. 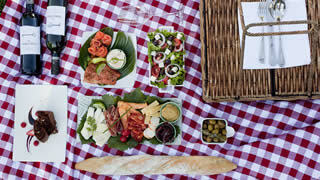 The picnic baskets comprises a charcuterie board, a selection of local cheeses, black bean and grilled corn salad, seasonal green salad, fresh avocado guacamole, artisan ciabatta, homemade tortilla chips, seasonal fruit and yogurt parfait as well as Mexican wedding cookies. Cosecha Restaurant is also well-known for their all day breakfast.